In this surreal affair — known after its date as the “10.26 incident” in South Korea — the head of the Korean Central Intelligence Agency popped the autocratic head of state during a private dinner party at a secret KCIA compound. The truth, eventually, would out. But the reason for this shocking internecine turn by a supposed confidante of the president? The murder was too well-planned to square with initial reports of an argument gone out of control. It seems a coup, but if so, our assassin disastrously — almost delusionally — miscalculated the post-Park lay of the land. Maybe we have to entertain the defendant’s own far-out claim to have struck against the authoritarian concentration of presidential power. I shot the heart of Yusin Constitution like a beast. I did that for democracy of this country. Nothing more nothing less. The controversial 2005 flick The President’s Last Bang offers a darkly comic look at the twisted mise en scene in the intelligence compound that fateful 10.26 … and doesn’t find a lot of participants worth admiring. * Park had survived previous assassination attempts, often authored by North Korea — including one that slew his wife in 1974. ** This uprising resulted in a death sentence against future South Korean president Kim Dae-jung — obviously not carried out. 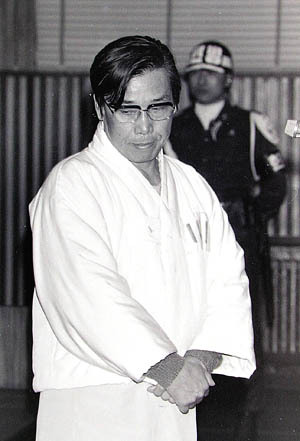 Under Kim’s administration years later, Chun was himself condemned to die for the massacre; Kim returned the gesture of clemency.